Some people have asked why I’m so agitated about the possibility that Republicans may acquiesce to tax increases as part of the Supercommittee negotiations. Rather than get into a lengthy discourse about the proper role of the federal government or an analysis of how the Bush-Obama spending binge worsened America’s fiscal situation, I think this chart from a previous post says it all. Republicans are considering a surrender on taxes because they are afraid that a deadlock will lead to a sequester, which would mean automatic budget savings. And the sequester, according to these politicians, would “cut” the budget too severely. But as the chart illustrates, that is utter nonsense. There are only budget cuts if you use dishonest Washington budget math, which magically turns spending increases into spending cuts simply because the burden of government isn’t expanding even faster. If we use honest math, we can see what this debate is really about. Should we raise taxes so that government spending can grow by more than $2 trillion over the next 10 years? 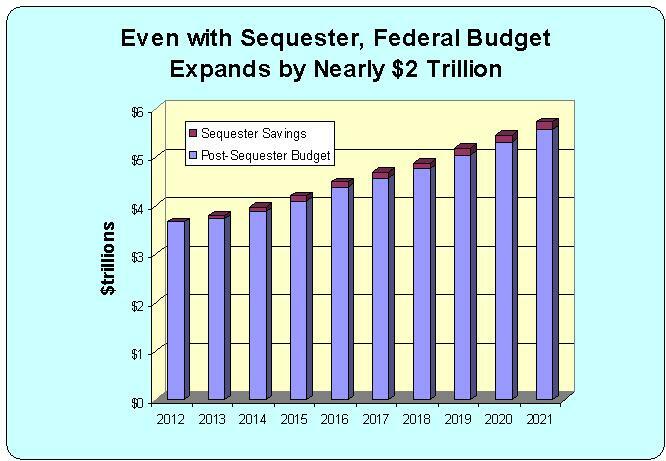 Or should we have a sequester so that the burden of federal spending climbs by “only” $2 trillion? The fact that this is even an issue tells us a lot about whether the GOP has purged itself of the big-government virus of the Bush years. A few Republicans say that a sellout on tax hikes is necessary to protect the defense budget from being gutted, but this post shows that defense spending will climb by about $100 billion over the next 10 years under a sequester. And that doesn’t even count all the supplemental funding bills that doubtlessly will be enacted. In other words, anyone who says we need to raise taxes instead of taking a sequester is really saying that we need to expand the burden of government spending. So even though Ronald Reagan and Calvin Coolidge are two of my heroes, now you know why I don’t consider myself a Republican. on May 12, 2012 at 11:36 am Will House Republicans Get Bullied into a Tax Hike By Obama? It is a problem with BOTH parties. There is no class of person or politician that can long survive the lack of accountability that comes with a job in the House or Senate. Unless there is some way to bring Congress back to being responsible to the states and the people, there is no check to the continued escaltion of grabbed power and control by the federal government. There will be no cap on the spending until there is no more borrowing. Until noone in the world can be convinced that we have enough of a prayer of paying it back that they will continue to float our currency. Republicans aren’t the stupid party Dan, they’re the hypocritical party, the party without principles. There is hardly a difference between the two parties actually. They both stand for their own power and privileges. I’ve registered Republican so I can vote for either Gary Johnson or probably Ron Paul in the primary but I feel sick to think that I’m officially a Republican.